Despite the immense body of literature about the American Civil War and its causes, the nation's western involvement in the approaching conflict often gets short shrift. Slavery was the catalyst for fiery rhetoric on both sides of the Mason-Dixon line and fiery conflicts on the western edges of the nation. Driven by questions regarding the place of slavery in westward expansion and by the increasing influence of evangelical Protestant faiths that viewed the institution as inherently sinful, political debates about slavery took on a radicalized, uncompromising fervor in states and territories west of the Mississippi River. Busy in the Cause explores the role of the Midwest in shaping national politics concerning slavery in the years leading up to the Civil War. In 1856 Iowa aided parties of abolitionists desperate to reach Kansas Territory to vote against the expansion of slavery, and evangelical Iowans assisted runaway slaves through Underground Railroad routes in Missouri, Kansas, and Nebraska. 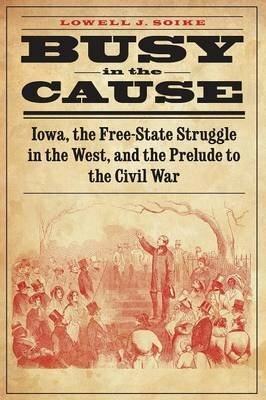 Lowell J. Soike's detailed and entertaining narrative illuminates Iowa's role in the stirring western events that formed the prelude to the Civil War.